Kew’s Grade 1 listed Temperate House is the world’s largest surviving Victorian glasshouse and the reopening in May 2018 will mark its 155th anniversary. The Temperate House has been closed for the past five years for a major restoration project, which has involved repairs to the entire framework and ventilation system, brickwork and statuary, as well as an overhaul of the planting and the inclusion of some of the world’s rarest plants. It is home to Kew’s temperate zone plants, containing specimens from South Africa, Central and South America, Asia, Australia, New Zealand and oceanic islands. Many of its best known species, such as its tree ferns, have been in Kew’s collection since the glasshouse first opened, or even longer. 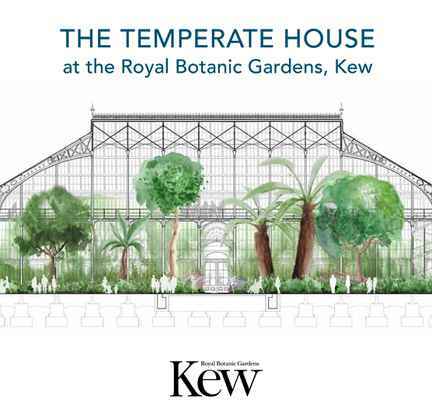 This book is a souvenir of the history of the Temperate House, and details the changes that have occurred in its 155 years, all accompanied with fascinating archival photographs and botanical illustrations. Central to the book is a pull out double page section detailing the new planting and layout of the House.